With four blisters the size of Jupiter and a right knee that threaten to snap on every step, my camino hasn’t been a walk in the park to say the very least. But then I’m reminded by the Word that “A man’s heart plans his way, but the Lord directs his steps…” – Proverbs 16:9. In the past two days, despite the pain and agony of trekking with the blisters rubbing against my open-faced Teva sandals – my feet are now way too swollen to fit into my Merrell hiking boots or my Nike Airmax – the long stretches of moments where I was simply walking on my own on the camino has been liberating. Instead of focusing groundwards on every step I made, I started to admire and give thanks for God’s handiworks in the beautiful Spanish northern countryside; enjoy great moments of peace and quiet, broken only by birds chirping; and taking the opportunity of capturing great postcardsque shots along the camino like the one above. 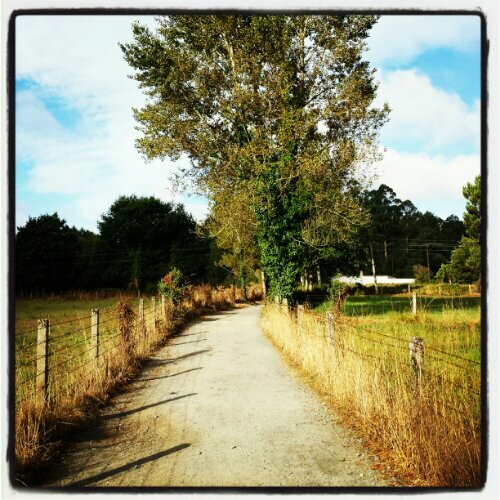 So glad I’m not alone on the Camino de Santiago….